How would you feel if unexpected guests were knocking at your door right this minute?Answering this question for myself, I have to admit that I would feel a little ashamed and embarrassed. But should I really feel this way. Afterall I am a stay at home mom of a toddler and a preschooler and they alone keep me fairly busy most of the day. How do you define clean? Does clean mean that everything in the home is shiny and spotless? Would you consider toys that are strewn around the home, unfolded laundry laying over the kitchen table, or toothpaste in the bathroom sink part of an unclean home? I personally would have to say no. These are part of everyday life. Like most people there are times when I do manage to catch up on home chores and make the home look clean and organized. However if one day passes whereby I don't do my normal daily upkeep it all falls apart rather quickly. 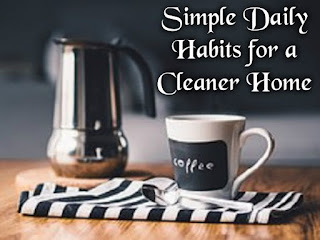 Even though I struggle many times to keep our home clean it is what makes it so important to stick to the following daily habits. 1. A hot cup of coffee. While you are waiting for your coffee to be ready wipe over the kitchen counters. Once coffee is ready sit an enjoy with some reading or social media. This can help get you motivated for the day ahead (works for me). 2. Make your bed. Air your blankets outside for a few minutes to freshen them up and eliminate dust. 3. Do a load of laundry. Before tackling anything else check how much dirty clothes is waiting to be washed. If there is enough for a load then start up the machine. You can focus on other things while the clothes is being washed. 4. Clean while you cook. Once food is placed on the stove or in the oven to be cooked you can wash up any dishes that you may have used for prepping the food. Once the meal is cooked and you have finished eating there will be much less dishes to clean. 5. Wipe out the bathroom sink at least once in the morning and once before going to bed. Wiping it down a few times per day is easier than doing it just once at the end of the day as toothpaste, soap, and other bits of materials do not sit long enough to dry hard. 6. Put items back in its place after use. A major issue we have in our home is keeping tabs on the nail clippers. For some reason it rarely ever makes it back to its storage space. 7. Keep documents and other papers organized. Instead of having piles of papers strewn all over the home file them away immediately. It only takes seconds to so and will save so much time and hassle when needing them at a later date. 8. Don't own unnecessary extras. When you have extras of the same material items space is wasted and your home becomes cluttered thus making it difficult to keep clean. 9. Put away clothes in their proper place whether it be placing dirty clothes in the laundry or clean clothes in drawers or closets. 10. Take shoes off at the door and put them away. Shoes worn inside the home can track not only dirt but also insects or bacteria leading to more required cleaning. 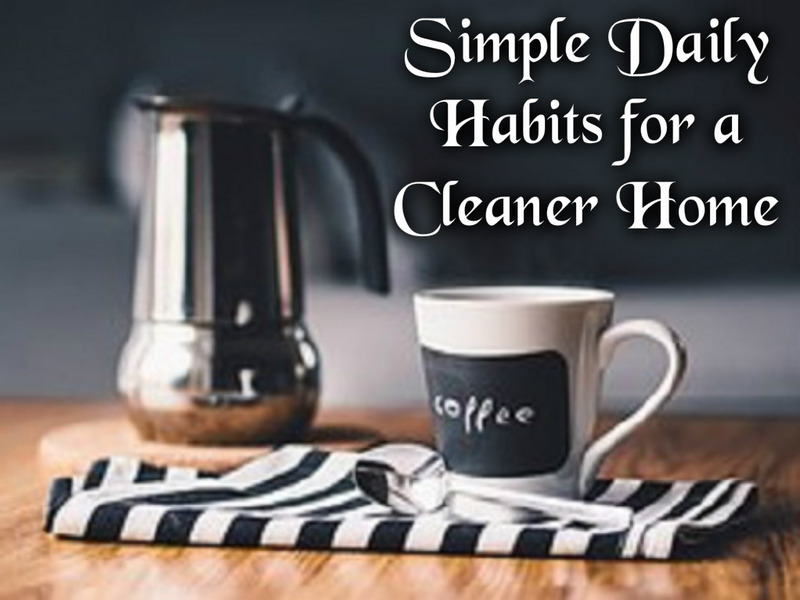 What are some of your simple daily habits that you do each day to help keep you home clean? These are really good tips. I love having a clean home, I find that it helps give me peace of mind. Having a cleaning schedule always works! These are great tips that you've put together. #8 is something that I need to work on. I love to hoard and I really should stop doing it because I end up owning so much stuff. Yikes. Putting things back where you got them is such a big help. If I can only get a couple others to do this all would be happy. This is such a great tip. Glad you actually shared it. I must take some notes or make a list. Thanks for this!